The topic of insulin sensitivity comes up frequently nowadays, and there is good reason. Reduced insulin sensitivity leads to high blood glucose levels and is the main cause of prediabetes and type 2 diabetes, which are increasingly common in the U.S., and can have serious consequences. It is good to become aware of what reduced insulin sensitivity, or insulin resistance, means, and, better yet, what to do about it. Advanced insulin resistance, such as in the case of type 2 diabetes, can mean that you need medications to control blood sugar. It can also mean that you have a higher risk for certain health conditions. Luckily, lifestyle changes can help you naturally increase insulin sensitivity, even if it has been decreased greatly. Healthy behaviors such as losing extra weight and getting active are usually effective at increasing insulin sensitivity. Lark can support your healthy lifestyle changes whether you have type 2 diabetes, prediabetes, or insulin resistance that is so minor that you may not even be aware of it. What is Reduced Insulin Sensitivity? Insulin is a hormone produced by your pancreas. It helps your body regulate blood sugar, or blood glucose levels. Sensitivity describes how sensitive, or responsive, cells in your body are to insulin. Reduced insulin sensitivity happens when cells in your body are not as responsive to the effects of insulin and have trouble taking up glucose from your blood. To make it clearer, here are some more details on what happens with normal insulin sensitivity. Many of the foods you eat contain types of carbohydrates called sugars and starches. Examples include bread, pasta, potatoes, cereal, sweets, and soft drinks. During digestion, your body breaks down the carbs into a type of sugar called glucose. The glucose goes into your bloodstream, which temporarily raises blood glucose, or blood sugar, levels. 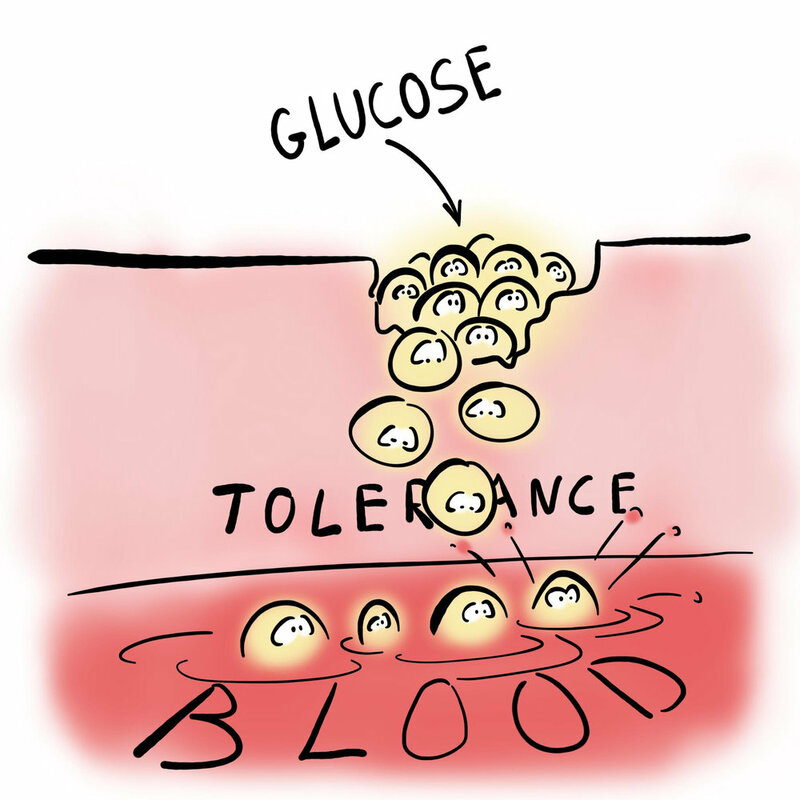 The glucose in your blood is carried to certain cells that use glucose for energy. Some of your cells, such as muscle, liver, and fat cells, use insulin to take up the glucose. During normal insulin sensitivity, these cells need a normal amount of insulin to take up glucose, which lets the level of glucose in your blood go back down to normal levels. Various triggers can lead to reduced insulin sensitivity. When it happens, insulin is not as effective on cells such as your liver, muscle, and fat cells. They need more insulin just to take up the same amount of glucose. Insulin levels in your blood rise. Eventually, glucose levels may rise if your pancreas can no longer produce enough insulin to keep up with the demand. Who Has Reduced Insulin Sensitivity? Lots of people have reduced insulin sensitivity – maybe even you! You have reduced insulin sensitivity if you have prediabetes or type 2 diabetes. That already includes 45% of U.S. adults, but that is not all. The truth is that insulin resistance can start to develop years or a decade before you have signs of it. How Is Reduced Insulin Sensitivity a Problem? Reduced insulin sensitivity can become a health problem. As it progresses, your cells are less and less able to respond to insulin; they need more insulin to “clear” glucose from your blood. At some point, your pancreas may not be able to keep up with demand. Insulin levels may not be high enough to let your muscles, fat, and liver cells get enough glucose out of your blood. The result is that your blood sugar levels may rise above normal levels, leading first to prediabetes, and then to type 2 diabetes. The progression can take years; in fact, you are likely to have reduced insulin sensitivity for up to a decade before you actually develop prediabetes. Reduced insulin sensitivity is not just a problem because a lot of people have it. It is a problem because it can lead to serious health consequences. Prediabetes is not likely to cause many or any symptoms, but it does increase risk for diabetes, and diabetes has its own set of concerns. Seventh-leading cause of death in the U.S. Most cases of type 2 diabetes are preventable, and your chance of preventing diabetes is higher if you try to reverse reduced insulin sensitivity early on. Reduced insulin sensitivity means you have trouble processing glucose normally. Your blood glucose levels can be higher than normal. While prediabetes symptoms are rare, you could have signs of high blood sugar if your blood sugar levels are consistently too high. This is likely correlated with reduced insulin sensitivity. Compared to having lower insulin sensitivity, having higher insulin sensitivity is linked to lower levels of insulin in your blood. The reason is that you do not need as much insulin to get your blood glucose back to baseline levels after meal. This is healthy, because it means that you can keep blood glucose levels normal when you eat carbohydrates without making your pancreas work so hard to produce and secrete extra insulin. There are many ways to increase insulin sensitivity naturally. [8, 9] Unlike with medications, these strategies have no harmful side effects. Instead their side effects may include increased energy, better mood, and lower risk for other health conditions! You can use this calculator to find out your body mass index (BMI) if you know your height and weight. A BMI over 25 is considered overweight, and a BMI over 30 is considered obese. The healthiest and most sustainable way to lose weight is usually to do it gradually. Together, that means that you do not need to follow a fad diet or cut out all good-tasting foods. Instead, consider adding one or more doable steps, such as the following, into your regular routine. Serve smaller portions of higher-calorie foods. That could mean ordering a small instead of regular fries or burger, or having only half a piece of cake. Add more low-calorie foods. For example, stir broccoli into mac and cheese or pasta sauce so that the same size portion has fewer calories. Or, start dinner with a green salad so that you are less hungry for higher-calorie foods for the main course. Choose water or decaffeinated tea or coffee instead of soft drinks, energy and sports drinks, and other sugar-sweetened beverages with calories. Swap less processed foods for highly processed ones to limit added sugars and unhealthy fats. For example, choose fruit instead of desserts, or roast chicken and fish instead of fried and battered choices. Whole grains, including oatmeal, popcorn, brown rice, whole wheat products, and wheat bran. Fiber, which is in plant products such as whole grains, vegetables, nuts and seeds, fruit, and legumes (beans, peas, and lentils). Healthy fats, including monounsaturated fats from olive oil, avocados, and peanuts, and omega-3 fats from fatty fish and flaxseed. Trans fats, which are in fried foods, plus processed foods such as some snack pies and cakes, doughnuts, and crackers. Added sugars from foods and beverages, such as soft drinks, desserts, sugar-sweetened cereal and yogurt, and other processed foods such as some baked beans, teriyaki and pasta sauces, and canned soup. Saturated fats from animal foods, such as fatty meats and butter. What about a low-carb diet? Some people try to improve insulin sensitivity by turning to a low-carb diet, which restricts high-carb foods such as bread and other grains and grain products, starchy vegetables, sugary foods, and even fruits and legumes. However, the jury is still out. A low-carb diet could lower your body’s demand for insulin, but there could be long-term harm from having too much protein or fat to make up for the low amount of carbohydrates. A smart-carb approach may be safest and healthiest. Spread your carb intake through the day, with one or two small servings per meal and snack. Avoid excessive amounts of carbs at once, such as large plates of pasta, huge bagels or muffins, or meals with bread, a side of rice or potatoes, and a starchy and sugary dessert. Look for high-fiber, less refined carbohydrate sources, such as whole grains, fruit, and starchy vegetables. Limit refined grains and sugars. Eat your carbohydrate with a source of fat and/or protein. Exercise is one of the quickest and surest ways to increase insulin sensitivity naturally. The benefits last for 24 to 48 hours, so try to get in a workout at least every 1 to 2 days to keep getting the rewards. 30 minutes most days, or at least 150 minutes per week. Work hard enough to be able to talk, but not sing. Can be used as an alternative to moderate-intensity cardio. Free weights, barbells, dumbbells, resistance bands, body weight, and weight machines. Hit each muscle group 2 to 3 times per week. Do 8 to 10 repetitions of an exercise, then repeat. 2 to 3 times per week or more. You have opportunities all day to increase insulin sensitivity naturally, and side effects can include feeling better in so many ways. Get enough sleep. A single night of sleep deprivation reduces insulin sensitivity. Being chronically low on sleep, as so many adults are, can harm your health even if you are doing everything else right. You can use Lark to get a handle on your sleep patterns and work on sleeping better if you are not yet getting enough. Manage stress better. Some stress is good, and too much stress is unfortunately common. The effects are not just in your head; being overly stressed alters your hormones and increases insulin resistance. Learning how to manage stress can help normalize your metabolism. Meditation, exercise, and deep breathing are some ways to manage stress. Lark can help you recognize when you are feeling stressed and remind you of ways to try to handle it through digital therapeutics. Medications can be necessary to keep normal blood sugar levels in check if your insulin sensitivity decreases too much. Still, even if you have diabetes, these natural support strategies can increase insulin sensitivity. They may make your medications more effective or allow you to take lower doses (of course, never change your medication dose without talking to your doctor first). Ready to Increase Insulin Sensitivity? If you are worried about reduced insulin sensitivity and are ready to increase it naturally, Lark is ready to help. The friendly health coach is available through your smartphone 24/7 to guide you and support you as you make healthy lifestyle choices. You do not need to be alone on your health journey!